Pellet stoves offer one of the best solutions to heating your homes, making them a great alternative to central heating systems that are costly to maintain. They are available in dozens of elegant designs that go well with any décor. In addition, they use environmentally friendly fuel known as pellets to heat up the room. You also have the option to use recycled corn, wood shavings or sawdust. While a wood stove can do incredible job heating your home, a pellet stove offers more efficiency. They are more versatile that wooden stoves, particularly because they run on pellets of wood. In addition, you can set them to a thermostat to ignite depending on when you need to warm your home. For you to make a right decision, it is important that you compare the best pellet stoves 2019 offerings on the market. Knowing the factors that you should consider also helps with the search. But do not forget to buy good wood stove fan, which will increase the efficiency of your stove. 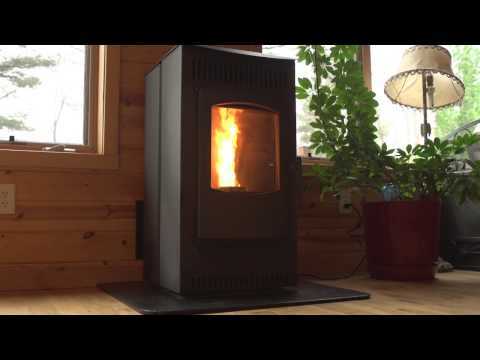 What is the Best Pellet Stove in April, 2019? Castle Pellet Stoves 12327 Up to 32,000 Up to 1500 sq.ft 12-24 hours 40 lbs Check price! Comfortbilt HP22 Up to 50,000 Up to 2800 sq.ft 40-50 hours 55 lbs Check price! Pleasant Hearth PH35PS Up to 35,000 Up to 1750 sq. ft 12-24 hours 40 lbs Check price! US Stove Company R5824 Up to 30,000 Up to 1000 sq. ft Up to 20 hours 40 lbs Check price! Pleasant Hearth PH50PS Up to 50,000 Up to 2200 sq. ft 24-70 hours 120 lbs Check price! Bosca BCPS500BL Up to 40,000 Up to 1500 sq. ft Up to 53 hours 80 lbs Check price! Timber Ridge 55-TRPIP Up to 52,000 Up to 2200 sq. ft 40-50 hours 80 lbs Check price! MagnuM BC-AC-NKL-Limited Up to 32,000 Up to 1400 sq. ft Up to 40 hours 50 lbs Check price! If you are in the market for an efficient pellent stove, the Castle Pellet Stoves 12327 will prove worth your while. It is a modern stove that features the best of the latest advancement in stove control. The smart controller allows you to choose between running the stove in thermostat, manual or operational mode. It adopts a space-saving design, making it a great option for small rooms. The fuel feed system is one of the most unique aspects of this model. It is a vertical auger feed system that is controlled with a digital control board, which is in turn controlled with a microprocessor that allows the system to run in a timer-based cycle. The heat distribution process is completed by a motor or draft fan. The blower ensures that the area adjacent to the stove isn’t extremely hot. The thermostat is a welcome feature as it allows the stove to operate in automatic mode. All you have to do is set the desired temperature and the thermostat will do the rest. The weekly mode enables you to schedule the stove to turn on and off at specific times of the week. Perhaps the best thing about this stove is that it is designed to serve at a priceless centerpiece in your home while providing great functionality. It also works with different types of pellets including standard ones, thus allowing you to adjust the exhaust voltage. The stove is constructed from steel, a material that is known for its durability and strength. The only threat to this durability is that the heat is in direct contact with the metal. One of the major brands that comes into mind when people think of pellet stoves is Comfortbilt. The Comfortbilt HP22 is one of their best offerings and combines compact design with high output quite well. The stove can generate up to 50,000 BTU’s of heat thanks to the 55-pound hopper. This is incredible considering that the hopper is way smaller than what you’d find on most stoves. The amount of heat generated is more than enough to warm up 2200 square, making it an excellent option for large homes. Another notable feature is the large convection blower pump that does a good job of pumping out the heat. With an 86% EPA efficiency rating, it’s easy to see why this stove generates so much heat within such a small profile. Comfortbilt offers a lot of convenient features including electronic thermostat controls, automatic ignition, programmable temperatures as well as an ash pan for easy cleaning. The remote control allows you adjust any settings, regardless of where you are. It comes with a one-year limited warranty on service and parts too. If you are in the market for something that offers efficient heating at an affordable cost, the Pleasant Hearth PH35PS is a good bet. This model has the ability to heat up to 2200 square feet for up to 70 hours on a single hopper. What we love most about this stove is that it has five unique heat settings. You can run it continuously, on a maximum or minimum setting. Pleasant Hearth incorporates an exclusive comfort control. This ensures that you are comfortable, regardless of how cold it is outside. This pellet stove also includes a convection blower as well as an outside air kit that requires little effort to assemble. The automatic lighting ignition is a welcome feature that makes it easy to use the stove. You will love the fact that this model has an EPA efficiency rating of 85%. With a weight of at least 200 pounds, the Pleasant Hearth is a beast. The door is constructed using solid cast iron for durability. The Pleasant Hearth Medium only requires 3-inches of clearance, meaning that you can place it virtually anywhere in your home. This provides the versatility you need to get your house heated efficiently and the outside air kit offers even more versatility. The design of this pellet stove makes it easy to clean and maintain. The US Stove Company R5824 is exactly what you need if you live in a small, crowded home. Its ultra compact design helps deliver maximum heat output in smaller spaces. Its modern design looks great in all décor themes. The stove comes with an air wash glass that acts as a large viewing window. One of the main advantages of the Forrester Pellet Stove is that it is fully automated with auto ignition as well as easy to use electronic controls. It has magnetic sides that provide easy access to interior of the unit. Also featured is a 40 pound hopper that does a good job of extending the burn time. It also reduces the amount of time spent refueling the stove. The US Stove Forrester is easy to install and this is attributed to its close clearance tolerances as well as its simple design. It is EPA certified and having a low environmental impact means that you don’t have to worry about any dangers. It is important to note that the unit is outside air compatible, hence more efficiency and suitable for use in mobile homes. This stove can produce up to 30,000 BTUs of heat and its exhaust pipe has a 3-inch diameter. The blower is a welcome addition that helps with even heat distribution in the room. The Pleasant Hearth PH50PS from Pleasant Hearth delivers efficient heating, regardless of the outside temperatures. The beauty of this stove is that it can be used in small homes of up to 2200 square feet including portable homes. Its price range falls between $1300 and $1800, which is quite fair given its low running costs. This incredible stove will heat your home with a single fueling for a period of 24-70 hours. The exclusive comfort control system ensures that our home isn’t overheated or under-heated, making this a perfect automated heater. One of the features that makes this pellet stove unique is the five-heat setting, which makes it possible to set the stove’s heat production to meet the needs of your home. You can always run it on either minimum or maximum settings. The arched cast iron door contributes to the stove’s timeless visual appeal. The door is also fitted with a ceramic glass viewing area so that you can watch the flames while a chrome handle improves the appearance as well as functionality. Another notable feature is the air wash system also provides a clear view of the flames while eliminating the worry of ash or smoke blurring the window. The modern and unique design of the Pleasant Hearth Cabinet Style ensures that it can fit in any home décor. The stove comes with a 120-pound hopper that helps extend the burn time to 70 hours. It is important that we take note of the inclusion of a convection blower and an outside air kit. Both of the above help redistribute the heat trapped inside the stove, thus enhancing the functionality. With BOSCA BSCPS500BL, you get everything you want and more. A single load of pellets gives you more than 50 hours of burn time. A large ceramic glass window provides a clear view of the flames and while its price is a bit high, the stove is eligible for Amazon Prime. One of the main attractions of the Spirit 500 is that it is incredibly easy to ignite, thanks to the automatic ignition. This stove is constructed from heavy duty steel for durability. It measures 25-inches by 23-inches by 37-inches, thus you can be sure that it won’t take up a lot of room. With a Euro flair and rounded sides, you will certainly love how this stove looks in your home. Additional features that you will find useful include the ability to be hooked into the a wall-mounted thermostat for precise temperature control. It is also EPA certified and approved for use in mobile homes as long as you have the optional air kit. The two speed blower included goes a long way towards helping with efficient heat circulation in the room. Perhaps the best thing about the Spirit 500 stove is the variable output in amount of heat it can generate. You can keep it as low as 8200 BTU if you need the room to be nice and toasty warm or you can crank it up to 40,000 BTU if you need the increased heat for the rest of the house. The stove comes with a hopper that can hold up to 70 pounds of pellets and is incredibly easy to clean. If you need something that’s perfect for contemporary styling or long term burning, the Timber Ridge 55-TRPIP will prove a good contender. The one-touch ignition makes it easy to use this stove and so does the user friendly digital control board. It comes with a large 80 pound hopper that does a good job of extending the burn time while reducing the need to add fuel often. Also featured is a large ash drawer that helps with easy cleaning. With the ability to produce 52,000 BTUs, the Timber Ridge Pellet Stove can heat up 2200 square feet of space. The large hopper provides up to 50 hours of heating and a small clearance of six inches means that you can install this stove almost anywhere. A thermostat is included for easy control. Unlike most stoves in this list that have 5 heat settings, this one has 9 heat settings for increased versatility. The door is made from steel and has a large viewing window so that you can watch the flames. The MagnuM BC-AC-NKL-Limited is a one of a kind pellet stove with a heating capacity of 10000 to 32000 BTUs depending on the amount of fuel used. It features a revolutionary firepot design that goes a long way towards increasing the burn times between cleaning. You will love its ease of use. This is attributed to the self ignition as well as the electronic control system. It is also important to take note of the quiet operation auger self feeds from the hopper. The hopper can hold up to 50 pounds of fuel, allowing you to enjoy long hours of heat and comfort. This stove is built in the United States using utmost standards of quality, reliability as well as ease of use. It has the latest in Tri-level combustion technology, standard auto ignition and electronic control, hence perfect for burning a variety of Flex-Fuels. The automatic shut-off feature eliminates the need to manually turn off the Magnum when there’s shortage of fuel. The large Pedestal ash pan makes cleanup afterwards easy. This stove comes with a one year warranty on the electrical components and a five year warranty on the structural components. There are many aspects that contribute towards finding a good pellet stove. The good news is that purchasing a pellet stove can be easy if you know what to look for. That said, here are a few factors you should consider. You want something that is easy to operate. Aspects to check here include how hard it is to start up and whether the stove is self-igniting or not. You also need to consider the ease of maintenance. The only real difficulties you will face after installation is purchasing fuel. This plays an important role towards the opinion consumers form in regard to the quality of a pellet stove. The options available from the market range from 20,000 to 100,000 BTUs. For best heating results, aim for something that produces at 60,000 BTUs. The BTU output generally means the ability of a stove to heat a home in relation to how big it is. The bigger the BTU figure, the larger the area it can warm up. Pellet stoves are available in two varieties. Pellets can be fed either from the bottom or the top. Bottom fed pellet stoves perform generally better than their top fed counterparts. This is because the feeding action helps remove any ash or deposits that can leave the firebox. You have the option to choose between an automatically or manually operated stove. Manual stoves are tasking as they require occasional tinkering to keep the air inlets working properly. You also need to pay more attention to automatic stoves in regard to temperature settings. Many of today’s options combine manual and automation for maximum efficiency. It is unfortunate that many people underestimate the importance of consumer reviews on retail sites and industry blogger websites. You however have to be weary of fake feedback to boost sales. Thermal efficiency is incredibly important. Look for stoves with at least 75% EPA rating for best results. These are some of the best pellet stoves available for home use. And while none of these units is perfect, they will certainly give you the best bang for your buck. If you don’t find any of them a satisfactory option, the buyer’s guide will help make your search for pellet stove that suits your needs easier.